Fenugreek or methi is a frequently used spice in Indian cooking. Fenugreek leaves (வெந்தய கீரை) are rich in vitamins and minerals, while fenugreek seeds (வெந்தயம்) have dietary fiber in addition to vitamins and minerals. Methi seeds are often used as home remedy for digestive problems. This kuzhambu has the subtle taste and gentle flavor of fenugreek. *Ladies finger and / or brinjal may be used to prepare this kuzhambu. Method: Heat a teaspoon of oil in a kadai. Fry toor dhal, Bengal gram dhal, methi seeds, and red chillies, till the dhals turn golden brown in color. Add asafoetida and switch off the fire. Allow it to cool. Grind the fried ingredients with little water into a fine paste. Soak tamarind in warm water for 15-20 minutes. Later squeeze tamarind and extract the juice. Add the ground paste, salt and jaggary to the tamarind juice. Mix well and keep aside. Heat the remaining oil in the kadai, add mustard seeds, and when they start to sputter, add the cut vegetable pieces, cover and cook till the vegetables are done. Now add tamarind juice mixture and bring it to boil. If the kuzhambu is watery, mix rice flour in little water and add the mixture to the boiling kuzhambu, stirring continuously. Allow the kuzhambu to boil for a minute and switch of the fire. Add sesame oil and garnish with curry leaves. 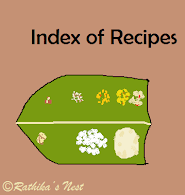 Note: You may add a teaspoon of kasuri methi (காய்ந்த வெந்தய கீரை) or fresh methi leaves (வெந்தய கீரை), when the kuzhambu boils and simmer for 1-2 minutes. This enhances the flavor of the preparation.